Long-time Federation Board member and charter captain Franklin Adams has been kind enough to offer to take the author on a spring turkey hunt in Big Cypress National Preserve (BCNP) for several years now. As the season conflicts with the Florida legislative session, I have always politely declined. This year, I was convinced to give it a try; our elected officials could live with­out me for a few days. We would be pursuing a true Florida native – the Osceola turkey, Meleagris gallopavo osceola. The Osceola is the smaller cousin to the far more abun­dant Eastern wild turkey, and is found only in Central and South Florida. Having been on a grand total of one turkey hunt in my entire life, I do not consider myself a turkey hunter. My leisure hours have been spent in pursuit of white-tails, by gun and bow, with some success. I had heard that chasing gobblers could be addictive, and my wife was already a deer season widow. I was trying to avoid another hobby at least until the last child left the house. Picking up lifelong hunting buddy Rob Far­ley at the Ft. Myers airport, we headed east into the interior. This is panther country, with the Florida Panther National Wildlife Refuge, CREW lands, Fakahatchee Strand, Everglades National Park, Big Cypress National Preserve (BCNP) and other public holdings providing a home not only for that most endangered of big cats, but for innumerable wading birds, alligators and many species of subtropical plants. This is definitely not the North Florida or Georgia Rob and I are used to hunting. 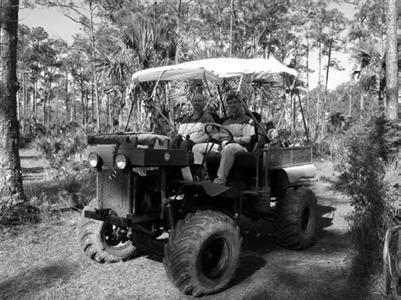 Franklin and former Board member Karl Greer met us at Monroe Station with their swamp buggies. The buggies are a relic of Cracker ingenuity. With a riding platform sitting several feet off the ground, Frank­lin’s home-made machine is powered by a1971 Ford Pinto motor. It is appropriately named “the Snail.” Karl’s slightly larger buggy, “the Pack Mule”, moves at a much faster rate. The BCNP Turner River Unit is usually very wet, thereby requiring the buggies as transport. The spring dry season now made our journey due north to camp a whole lot easier, though somewhat dusty. By the time we had crawled our way over the trail to the 1950’s era camp, we had reached what was arguably the most remote spot in this heavily populated state. The 720,000 acre Big Cypress, managed by the National Park Service, is not named for the size of its trees, but the number of them. The soils here are very poor and very thin. In many places, the rock actually forms the surface of the ground. One can easily envision when this was all under the ocean. Hundred year old cypress stand fifteen feet tall and can only boast a girth of a few inches. Dahoon holly, cabbage palms, wax myrtles and saw palmetto stretch as far as the eye can see. Pine islands with native Florida slash stood on “hills” just an inch or two higher than the surrounding land­scape. Watery gator holes surrounded by black willows provide sustenance for many animals during drought. It is estimated over 850 species call BCNP home, with 72 of them listed as endangered or threatened, in­cluding wood stork and one of the six types of air plants that exist here. As with all of South Florida, invasive species must be controlled, including Brazilian pepper and Australian pine. The introduction of foreign animals, such as pythons, is also a concern. Our first turkey hunt found us prowling the woods’ roads, with me toting the gun and Franklin calling on the box that replicates the yelp of a hen interested in love. You can only hunt until 1 pm, but as the toms stop gobbling way before then, and the bugs and the temperature increase as the day progresses, that is not a major concern. Although we set up one time, no interested males showed up. Back at the camp, we learned that Rob and Karl had heard a number of birds, but could not get them to come in. Lunch that day was delicious, and as we sat in the kitchen looking out the screen window, Karl exclaimed with some minor profanity – a turkey was walking through the camp, not 10 yards from where we sat! It was a jake, or young male turkey. As it was still hunting hours, I grabbed my shot­gun and did a creep after in my shorts and hunting boots after this wily critter. I saw his head pop up in the palmettos before he left me far behind. I think he was laughing, but it was hard to tell. That afternoon, we lazed around, enjoying the cool breeze. Rob and I got to take one of the buggies over to a man-made pond, created by some industrious pioneer with dynamite. We did not catch anything, but it was a hoot to see alligators swimming in the clear blue water. Our second morning involved all four of us traipsing to an old airstrip carved out of the surrounding wilderness. As Karl took off on a jaunt, Rob set up with his decoys: two hens and a jake. Franklin and I ensconced our­selves about 400 years down the strip from Rob in the palmettos. We watched as a doe deer came and got her hidden fawn out of the woods; the little spotted cutie imme­diately began to nuzzle and suckle its mama. A beautiful sight. Franklin told me he would hit the call when he heard a gobble, which he started doing almost immediately. I strained to hear the turkey that was talking to Franklin, but never could. I turned to him and whispered “Should we move?” and he just smiled and shook his head “No.” About half an hour later, as I peered down the woodline, a tur­key popped out of the brush and went into full strut. It has been a while since my heart pounded like it did when that bird showed itself. As the tom started working his way towards us, he walked, then strutted, bowing his wings out and holding his tail up to be as big as possible to the lady birds. After 50 yards or so, he must have spotted Rob’s decoys, because he started running. Head stretched out and with only one thing on his mind, I was able to get my gun up onto my knee and take him down at about 20 yards. I haven’t whooped like that in a very long time. Many pictures later, we left Rob to continue his hunt and strolled back to camp to dress the 13 lb. gobbler. My first turkey – the elusive Osceola! As I finished cleaning the bird, here comes Rob and Karl, with turkey in tow. Not long after we had left him, Rob called in a gobbler identical to mine, and took him while he showed off to the decoys. I couldn’t believe it. We had both taken birds! With two turkeys in the bag, we got to sit back and enjoy the rest of our stay. I noticed a strange looking object in the corner of the bunkhouse that looked somewhat like a bright red bazooka. Franklin related as to how it was a potato gun, fueled by cheap hair spray (the same type of weapon the late Governor Lawton Chiles used during his second inaugura­tion). Apparently, when a lighter is held to the containerized spray, the gun expels a spud not only with tremendous velocity, but a fair bit of accuracy. For several years, the camps have held a contest of skill to see who could score more points by knocking off body parts of a plywood depiction of the Skunk Ape. For those not in the know, the Skunk Ape is a cousin to the fabled Yeti, or Abominable Snowman, and is reputed to haunt the Big Cypress. Indeed, the International Headquarters for Skunk Ape Research is located near Big Cypress, and there are reported sightings every once in awhile. The HQ sells Skunk Ape related items, likely lovely key chains and unique mouse pads showing the Ape in all its glory. Anyhow, the sad part of the story is that due to the present economic slump, the Skunk Ape Shootoff had to be cancelled this season. Life ain’t fair sometimes. Many thanks to Franklin and Karl for their South Florida hospitality and for sharing a truly rare piece of Old Florida. And thanks to the Osceola’s for being so cooperative. Picture 1: Bob Farley and Preston Robertson on the Snail.